The patella, or kneecap, as most people know it, sits in a groove in the end of the femur. This groove can sometimes become too shallow, and the patella will luxate to the side of the knee. Dogs with a luxating patella will sometimes hold their leg up suddenly and then stretch the leg forward or backward to “pop” the patella back into the groove. 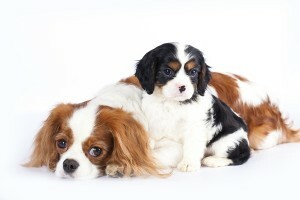 This usually happens in small breed dogs, such as Bichons, Chihuahuas, and Beagles. It can happen in large breeds, but it is not common. Most small dogs that are a normal weight cope well with luxating patellas and get used to popping the knee back in. Eventually the condition may require surgery to fix. The abnormal movement of the patella over the ridges of the groove will cause degeneration of the joint and arthritis. Or the kneecap will become so uncomfortable out of place, that the dog stays lame most of the time. Surgery generally consists of deepening the groove and fixating the patella so it can’t slide side to side. Most dogs recover well from this surgery with about 10 weeks of restricted activity.